To survive and reproduce, all living organisms must adjust to conditions imposed on them by their environments. An organism's environment includes everything impinging upon it, as well as everything that is affected by that organism. Conformity between an organism and its environment constitutes what biologists call adaptation. Plants and animals have adapted to their environments genetically and by means of physiological, behavioral, or developmental flexibility, including both instinctive behavior and learning. Adaptation has many dimensions in that most organisms must conform simultaneously to numerous different aspects of their environments. Adaptation involves coping not only with the physical abiotic environment (light, dark, temperature, water, wind), but also with the complex biotic environment (other organisms such as mates, competitors, parasites , predators, and escape tactics of prey). Conflicting demands of these various environmental components often require that an organism compromise in its adaptations to each. Conformity to any given dimension requires a certain amount of energy that is then no longer available for other adaptations. The presence of predators, for example, may require that an animal be wary, which in turn is likely to reduce its feeding efficiency and hence its competitive ability. For a small bird, trees are an important part of its environment: They offer vital shade during the heat of a hot summer day, places to forage for insects, safety from ground-dwelling predators, and safe places to build nests and raise chicks. Blades of grass or hairs used to line a bird's nest are also important components of a bird's environment. During the dangerous night, a bird copes with nocturnal predators such as raccoons by sleeping perched on a small twig high above the ground. While gleaning tiny insects from tree leaves during the day, a bird remains alert for diurnal predators like hawks. 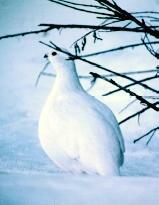 A willow ptarmigan in winter color. Many birds cope with changing seasonal conditions by migrating to warmer places at lower latitudes where there is more food. Over eons of time, natural selection has molded birds to make them effective at escaping from the predictable dire consequences of winter (a time of high mortality). Birds that did not successfully evade winter's icy clutches died without leaving any surviving offspring, whereas those that migrated survived to pass on their genes. Natural selection has endowed birds with a built-in biological clock, which they compare against day length, effectively giving them a builtin calendar. Changing day length affects a bird's pituitary gland, causing it to secrete hormones that control avian behavior. Short autumn days elicit a "wanderlust," ultimately leading to migratory behavior. Experiments with migrating birds in planetaria have shown that tiny bird brains have been hard-wired so that they contain a map of the stars. Indeed, natural selection "invented" celestial navigation. Organisms can conform to and cope with a highly predictable environment relatively easily, even when it changes in a regular way, as long as the changes are not too extreme. Adaptation to an unpredictable environment is usually more difficult; adapting to extremely erratic environments may even prove impossible. Many organisms have evolved dormant stages that allow them to survive unfavorable periods, both predictable and unpredictable. Brine shrimp in deserts and annual plants everywhere are good examples. Brine shrimp eggs survive for years in the salty crust of dry desert lakes; when a rare desert rain fills one of these lakes, the eggs hatch, the shrimp grow rapidly to adults, and they produce many eggs. Some plant seeds known to be many centuries old are still viable and have been germinated. Very small undirected changes in the physical environment can sometimes improve the level of adaptation between an organism and its environment, but large changes are almost always detrimental. Changes in the environment that reduce overall adaptation are collectively termed the "deterioration of environment." Such changes cause directional selection resulting in accommodation to the new environment, or adaptation. Changes in biotic environments (such as the hunting efficiency of an organism's predator) are usually directed and typically reduce the level of adaptation. Every individual is simultaneously a member of a population, a species, and a community; therefore, it must be adapted to cope with each and must be considered in that context. An individual's fitness—its ability to perpetuate itself as measured by its reproductive success—is greatly influenced by its status within its own population. An individual might be a resident or a vagrant, mated or unmated, or high or low in a pecking order, all factors that strongly affect its fitness. Any given individual's fitness is also influenced by various interspecific associations of its species and especially by the particular community in which it finds itself embedded. Individuals and species must "track" their environments in ecological and evolutionary time, adapting and evolving as their environments change. Natural selection acting on natural enemies (prey, parasites, and predators) will always result in a deterioration of an organism's biotic environment, diminishing fitness. Every prey-predator or host-parasite interaction constitutes an escalating "arms race," in which moves alternate with countermoves. 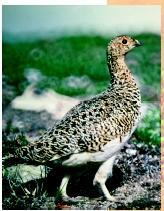 A willow ptarmigan in summer color. Prey that are better able to escape from their predators, or hosts that can better resist infection by parasites, will enjoy a fitness advantage. But better predators and better parasites are also favored by natural selection themselves, assuring that the arms race will continue to escalate indefinitely. Indeed, most species are probably evolving rapidly just to maintain a given current level of adaptation in the face of a continually deteriorating environment. Still other interactions between species are mutually beneficial, resulting in increased fitness for both parties, such as between plants and their pollinators. Any genetically based physiological, behavioral, or ecological trait that enables an organism to cope with, and to survive and reproduce in, its environment represents an adaptation. Some traits may not be adaptive but simply leftover vestiges of traits that once were adaptive. A given trait can also be "preadapted" if it was formerly adaptive under some prior set of conditions now gone but is later co-opted as the basis of a new adaptation under some new environmental conditions. For instance, it is likely that bird feathers were initially important for temperature regulation, rather than for flying. Fisher, Ronald A. The Genetical Theory of Natural Selection. Oxford: Clarendon Press, 1930. Pianka, Eric. R. Evolutionary Ecology, 6th ed. San Francisco: Addison-Wesley-Longman, 2000. Human-being also adjust to conditions of environments, nice sharing with us.